Some time, the 30 year bond bull ends. It may already have done so. Or it may take years and the heads of many who try to short, as in Japan. 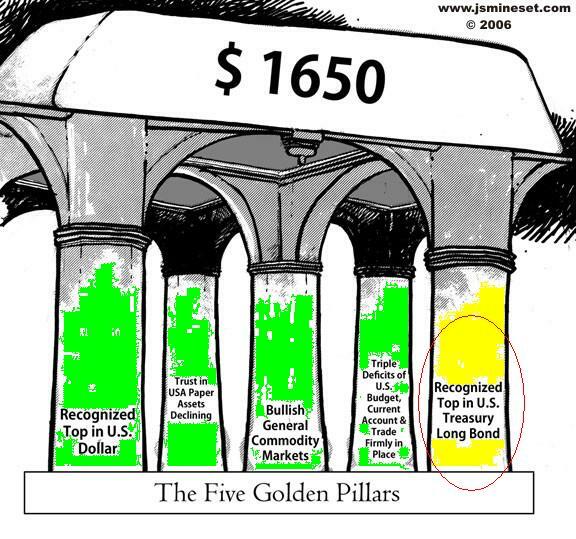 But perhaps the real gold bull starts with the last pillar, as outlined by Sinclair. The current bubble is probably in treasuries. Record low interest rates paid by governments in record levels of debt. Perhaps the "cancellation" of central bank owned bonds can bail governments out, but such flagrant monetisation would deeply damage faith in fiat money and bonds. Somewhere Bond interest rates climb, either to combat inflation, or to attract funds because central bank monetisation is discontinued. As rates climb capital values, particularly of long bonds, are decimated. In a rising interest rate environment company profits would be expected to decline and stocks fall. Property prices, supported by low mortgage rates could suffer. Gold may be the refuge for large flows of capital. China's role in these flows could be significant. John Dizard at the FT discusses where capital is safe, or not, in the case of government bonds for the long term. Less convinced on gold. The solvency problems of the euro area states and banking systems can almost certainly be put off until next autumn with one liquidity wheeze or another. No, the problem with this numbing complacency, for owners of capital at least, is that they aren’t being forced to think about the certain losses of real value that come after this Sitzkrieg is over. After all, a rich person or institution can’t put everything into gold bullion. You can’t run while holding it, or earn any current income. All those bars or coins are fairly easy to seize or forcibly convert into central bank-printed currencies. So, since many, if not most, of you have to hold some euro area fixed income paper, how would you preserve the most value through the next mutation of the euro area’s crisis? Once you’ve bought all the microscopically low-yielding Bunds you could want, that is? My belief is that even after this year’s contraction of euro area corporate bond yields, an investor has much less risk, over time, in that asset class than in euro area sovereign bonds. And they get paid slightly more for taking that lower risk, as long as they do bond-issuer picking, rather than index buying. For my money, the top three factors at play as to when and how the gold-spurt will begin are purchase saturation in the top-end property sector; what happens in relation to Spain and Greece in the eurozone; and the extent to which bank liquidity defences can be massaged upwards. QE is a failure, but it’ll be a while yet before it becomes clear to Mr & Mrs Gameshow that cash is being diluted in order to help banks who won’t help themselves. Some time after that, the Big Boys need to decide which of two ominously dangerous policies to try next: money-printing on a grand scale, or raising interest rates in order to stem the gold rush and restore some faith in the citizen’s ability to keep up with inflation. (Or, funnily enough, both at once in a race to the bottom). Gold and property remain the only two ways guaranteed to help protect what wealth one has left. Globally today, we have stock markets everywhere that are ludicrously overvalued….propped up as they are by Zirp and QE. But in the trade-off between reduced consumer purchasing power and confidence-boosting stock market levels, push must come to shove in the end. When it does, gold will go stratospheric….and then sovereigns will ban its private sale. The sector they manipulated for years to keep mugs happy with flakey debt bonds and air-fuelled bourses will be blocked off formally. I don’t know what happens after that, and I’ve yet to see a convincing account of what will happen. Also, I don’t want to think about such an aftermath. For the moment, I remain focused on the window left open to gold-bugs, and stuffing as much wonga through it as I can before the shutters come down.